Elizabeth Liebert was born and raised in Seattle, Washington, as the only daughter of three children of Irene Doll and Joseph Liebert. She attended Holy Names Academy for both her grade and high school, so she knew many Sisters of the Holy Names all through her growing up years. Especially significant among these relationships were her music teachers, who offered her a window into beauty, creativity, deep personal relationships and joyful community life. Upon graduation from HNA, she entered the novitiate at Marylhurst, Oregon, as one of the first class of postulants for the newly formed Washington Province. After completing her undergraduate degree at Fort Wright College of the Holy Names and Gonzaga University, she taught at St. Aloysius, Spokane, as a math specialist. She then completed a Master’s degree in Religious Studies from Gonzaga University, and began teaching at Fort Wright College in the religious studies department, where she also directed the Christian Ministries Graduate Program. 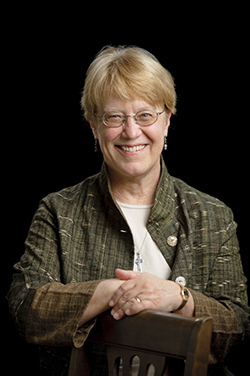 Realizing that she wanted to continue teaching undergraduate and graduate theology and religious studies, she subsequently completed a PhD at Vanderbilt University. Then followed thirty-two years in seminary teaching, with the past twenty-eight at San Francisco Theological Seminary and the Graduate Theological Union. She recently served as Dean of the Seminary and Vice President for Academic Affairs at SFTS, and is currently Professor of Spiritual Life and Director of the Program in Christian Spirituality. She is the author, co-author or co-editor of five books, the sixth, titled The Soul of Discernment: A Spiritual Practice for Communities and Other Institutions, to be released in August, 2015. Her long-standing interest and commitment to spiritual formation has resulted in working several times in SNJM formation programs. She is currently the Novice Director for the U.S.-Ontario and Manitoba provinces. She also consults on formation, spirituality and charism for the Congregational Leadership of the Sisters of the Holy Names.